Chicken turtles are native to the United States, specifically in the southeastern part of the country. There are three subspecies that belong to this group – Florida chicken turtle, Eastern chicken turtle, and Western chicken turtle. Previously, these turtles are commonly eaten in the regions where they are found. According to some people, they taste like chicken, which is exactly where they got their name. The chicken turtles are not protected species, which makes it fairly easy to own them as pets. The physical appearance of chicken turtles will vary across the subspecies, although they share many similar characteristics. The Florida Chicken Turtle has yellow or orange lines in its carapace without markings in its plastron. The Eastern Chicken Turtle, on the other hand, is duller compared to the color of Florida Chicken Turtle. The carapace has narrow brown or green lines. On the other hand, the Western Chicken Turtle has a flatter carapace compared to the two and has dark markings along the edges of its plastron. One thing that is common in the three subspecies of chicken turtles is that they all have large inquisitive eyes. Their necks are also long and marked with noticeable stripes. They have a pear-shaped carapace and webbed feet, which make it easy for them to swim. These turtles are mid-sized, usually from six to nine inches. The males are usually smaller, and the females can reach a length of up to 12 inches. While the turtles are aquatic, they are usually seen on land, especially when they are migrating or looking for an area where they can create burrows. They are known to be active and they spend most of their time basking. They are most active during the day and they hibernate in mud and vegetation. The chicken turtles are semi-aquatic, which is why you can find them both on land and in water. When they are in the water, they prefer places that are quiet and calm, such as ponds, cypress, marshes, and other places with heavy vegetation. They also like bodies of water with soft substrates. In captivity, on the other hand, chicken turtles will thrive in a place that has clean and aerated water. The water should be filtered to avoid health problems. Another important component of their modified environment is a basking spot. A good example of the latter is the Exo Terra Crocodile Skull Terrarium Décor. When it is elevated, it can provide a spot where turtles can go if they need a break from the water. When the chicken turtle is kept indoors, a stock tank or a large tub is a must. If the tank is large enough, up to three of these turtles can be kept in the same place. If ever they show signs of aggression, however, they have to be placed in isolation. As for the size of the tank, the average depth should be 20 inches, length is 84 inches, and width is 48 inches. 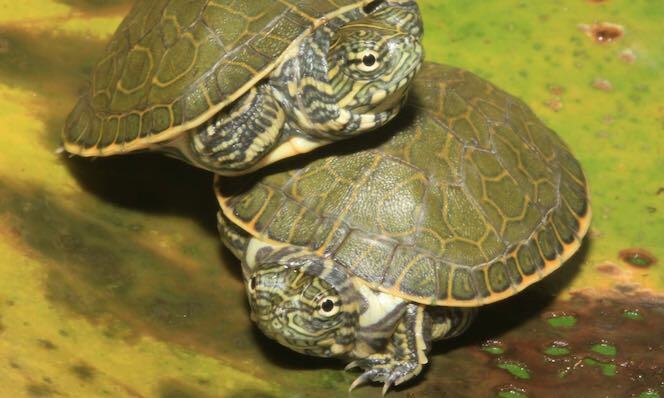 A 75-gallon tank, meanwhile, will be good for up to two male chicken turtles. Since females are larger, one turtle will need a tank with an average capacity of 125 gallons. To mimic the conditions of their natural habitat, it is also important to put a driftwood or artificial plants. One of the best products to have is the Exo Terra Plastic Terrarium Plant. They are a realistic replica of plants that will provide the turtle with a natural hiding spot. Chicken turtles can also live in outdoor ponds, although it is necessary to provide them with an area for hibernation when they get tired of swimming. Similar to many other types of turtles, they are omnivores. A varied diet of plant and animal matter will be necessary to keep them in their best state of health. When they are younger, most of them are carnivorous. To be specific, some of the foods that can be given to chicken turtles include fish, tadpoles, crustaceans, aquatic insects, and crayfish. Plants, such as water lettuce and water hyacinth, should be introduced once the turtles mature. For the vitamin supplements, like with the other turtles, calcium is one of the most important to be a regular part of their diet, especially for their shell and bones. One of the best is the Rep-Cal Phosphorus-Free Calcium with Vitamin D3. It is made using 100% oyster shell and is formulated to improve the turtle’s ability to absorb calcium. When this is given, the turtle will not require any other supplementation. One of the reasons why chicken turtles are popular as pets is the fact that they do not suffer from a lot of health problems, especially if you are cautious of how to take care of them. However, if the water is not clean, they can exhibit different forms of shell and skin infection. More so, if the water supply is contaminated, it is not unusual for them to have abscesses in the ears. Obesity can also be a problem, specifically if you feed them only with commercial turtle pellets. To avoid this, they should be given a varied diet. Those that are held in captivity as pets should not be released in the wild. Having non-native species in the wild can introduce diseases and confusion. To prevent the spread of infection in the enclosure of the chicken turtle, one product that can prove to be promising is the Zoo Med Wipe Out 1 Cleaner. For the captive care of the pet turtle, ensure the best living conditions. In this case, it is recommended that the air temperature should be 75 to 85 degrees Fahrenheit. For the basking temperature, it can be as high as 90 degrees. The water temperature, on the other hand, should be 75 to 85 degrees. To make it easier to monitor the temperature, invest in a product like the Zoo Med Economy Analog Dual Thermometer and Humidity Gauge.